Eduard 1/48 Hellcat Mk.I/Mk.II Dual Combo! 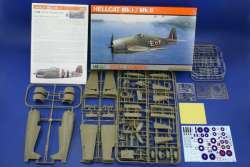 Home Special Offers Eduard 1/48 Hellcat Mk.I/Mk.II Dual Combo! Hellcat Mk.I JV132, Lt. Blythe Ritchie, 800 Sqn FAA, HMS Emperor, May 8, 1944. Hellcat Mk.I JV131, 800 Sqn FAA, HMS Emperor, June, 1944. Hellcat Mk.I FN430, 1844 Sqn FAA, P/O Hannay, HMS Indomitable, August 24, 1944. Hellcat Mk.II JX814, 1844 Sqn FAA, Sub-Lieutenant W.M.C. Foster, HMS Indomitable, Okinawa, April 12, 1945. Hellcat Mk.II JZ796, 808 Sqn FAA, Sub-Lieutenant Oscar Lorenzo, HMS Khedive and HMS Trincomalee, Ceylon, 1945. Hellcat Mk.II JZ935, 1839 Sqn FAA, HMS Indomitable, Sub-Lieutenant T.B. Speak, April 5th, 1945.